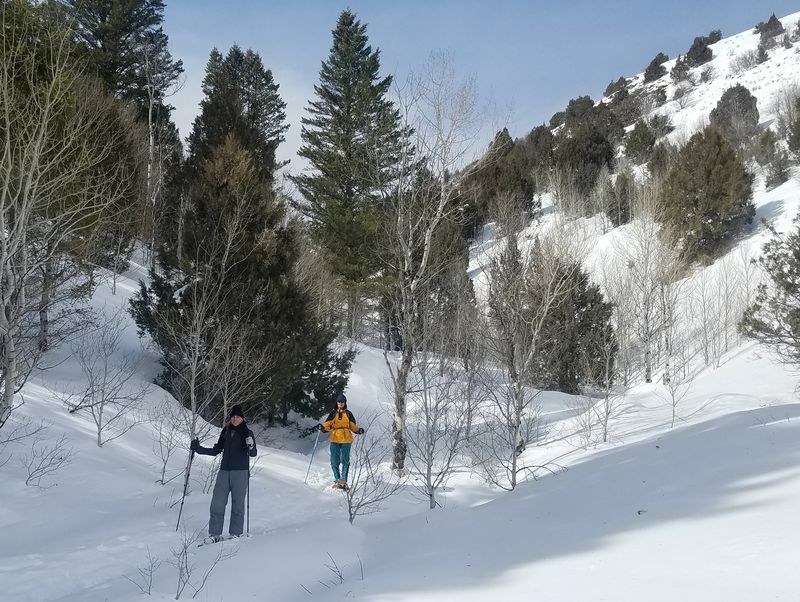 Originally scheduled for Cottonwood Canyon, we went to Blind Hollow because there was too much snow to park at Cottonwood Canyon. 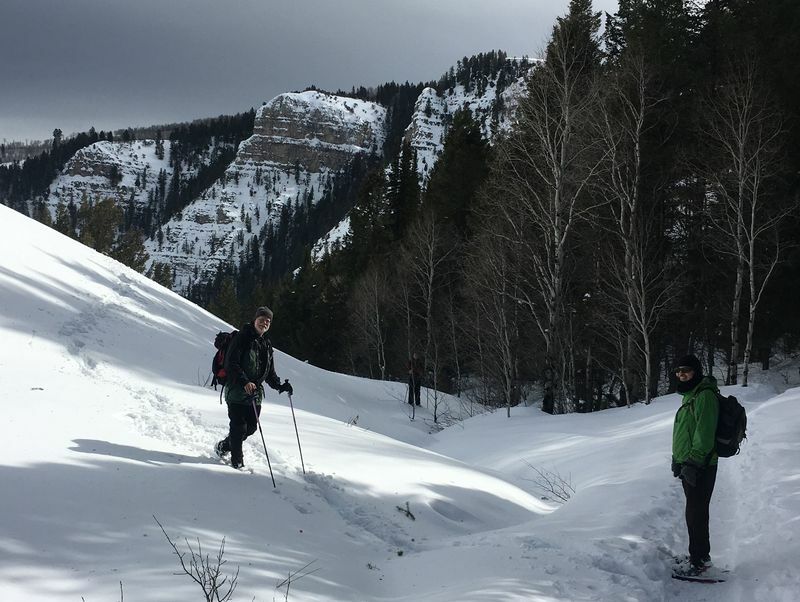 Six Cache Hikers met at our usual location, organized carpools and started up Logan Canyon. 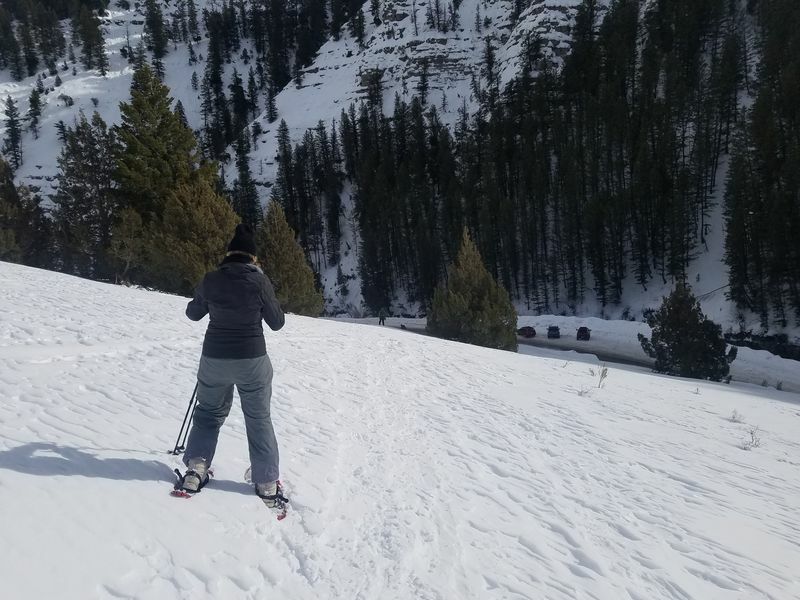 Our original objective was Cottonwood Canyon, but the small parking area there was blocked by large piles of snow from previous snowplow activity. We continued up US-89 to the parking area at Blind Hollow, our alternate objective. 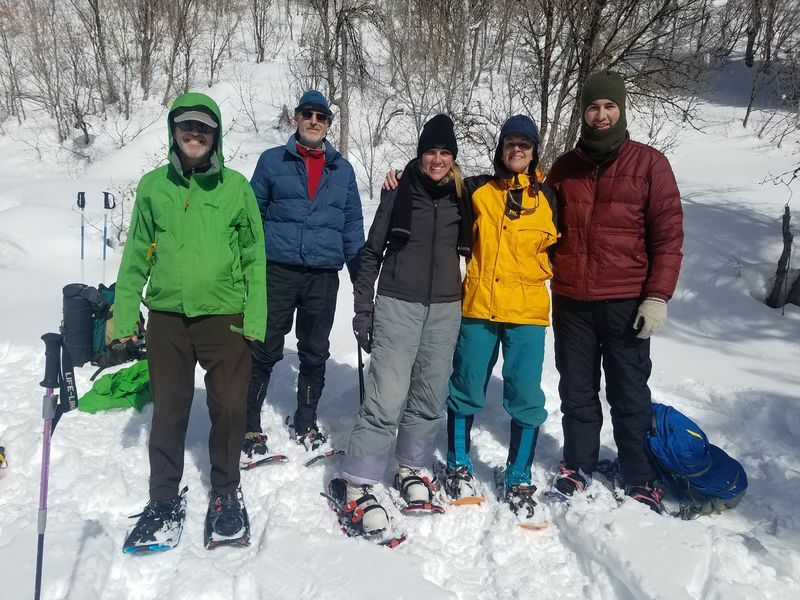 One of our hikers had a broken snowshoe. 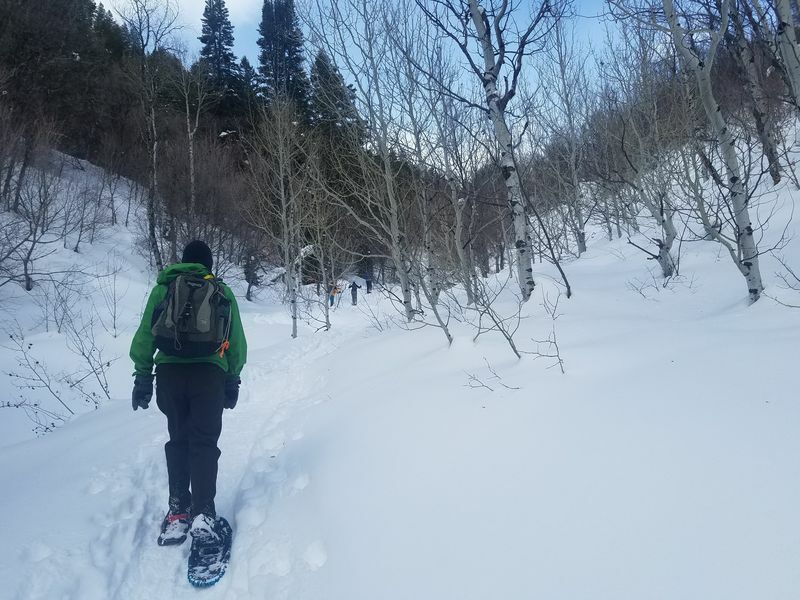 We were not able to fix it but another hiker lent him a spare snowshoe. We hurried up the steep open slope above the parking area in an attempt to get out of the biting wind and blowing snow. Fortunately the wind calmed a bit as we entered the shelter of Blind Hollow with its trees and canyon walls. About 12:25 we stopped in a sunny and calm spot to enjoy our lunch. There was talk of continuing further up the trail, but we were not prepared for the extra time that this would take. After lunch we headed back down the trail. 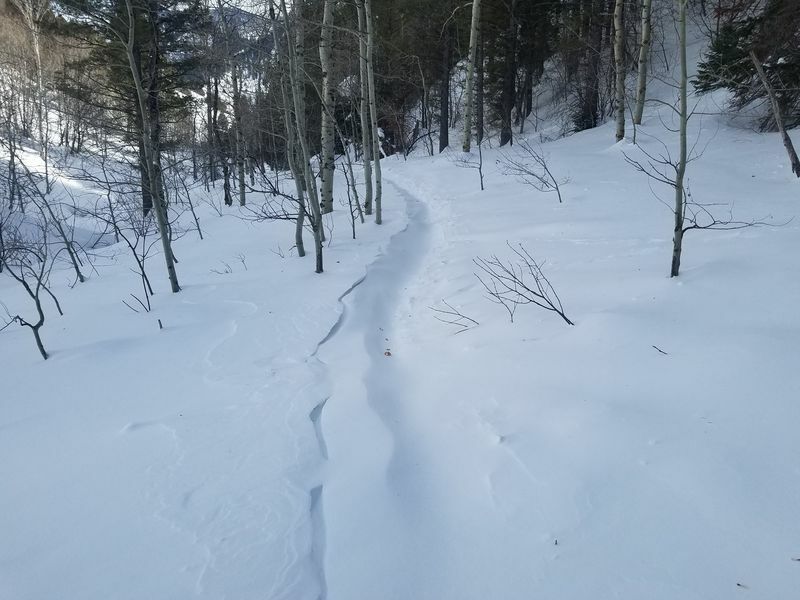 As we approached the mouth of Blind Hollow we encountered the wind again, and drifted snow covered the tracks we made on the way up. Threatening clouds gathered in the sky ahead to the south but we still had blue sky behind us. 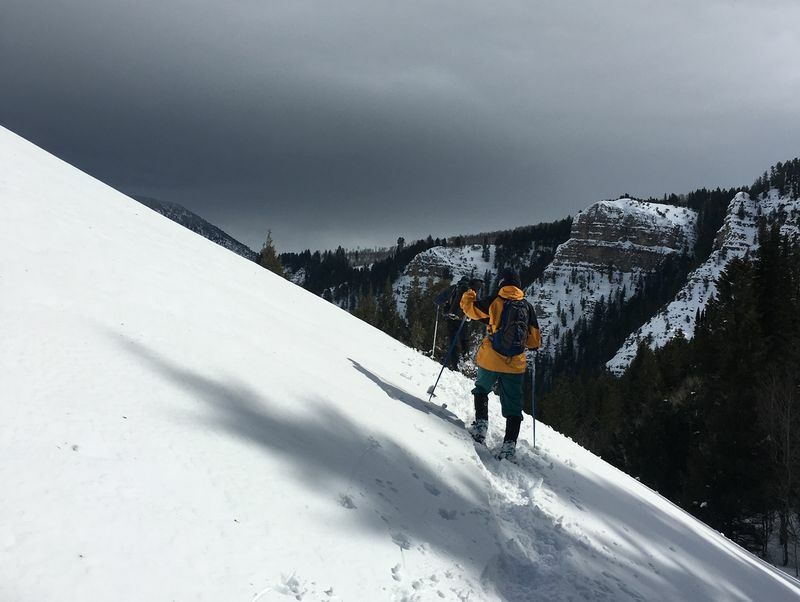 We descended the steep and wind-carved slope to the trailhead, where we found snow drifts building up along the edge of US-89. Participants: Nick (leader), Dave W., Dan, Bryce, Becky and Kathleen. Drove 17 miles up Logan Canyon, to the Blind Hollow trailhead parking area. Arrived at the trailhead about 10:45 and started hiking about 11:00. Enjoyed lunch in a sunny sheltered spot, 12:25 - 1:15. Back at the trailhead about 2:30 and Logan about 3:00. Windy, with blowing snow in exposed areas. Partly sunny, with increasing clouds in the afternoon. 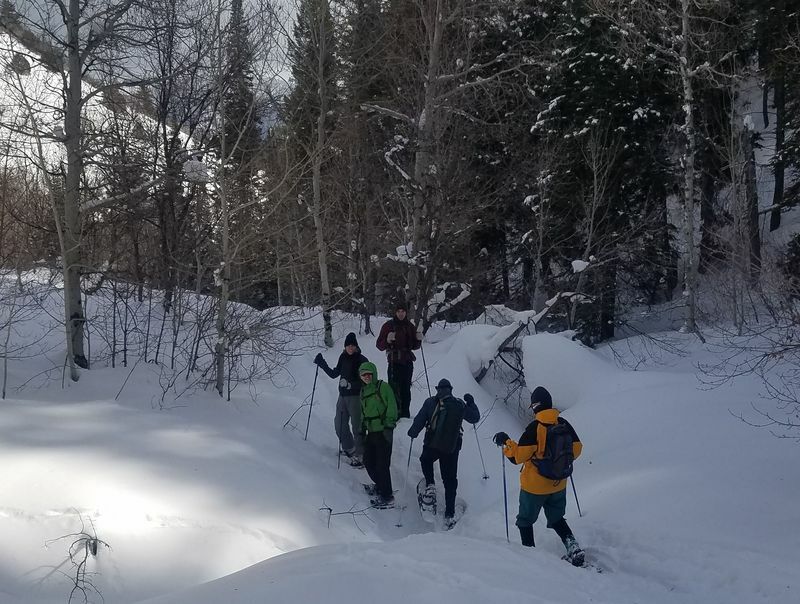 Temperatures were in the 30s, with 59" of snow at our lunch spot. Our GPS track shows about 3.5 miles with 1100 feet of ascent and descent. 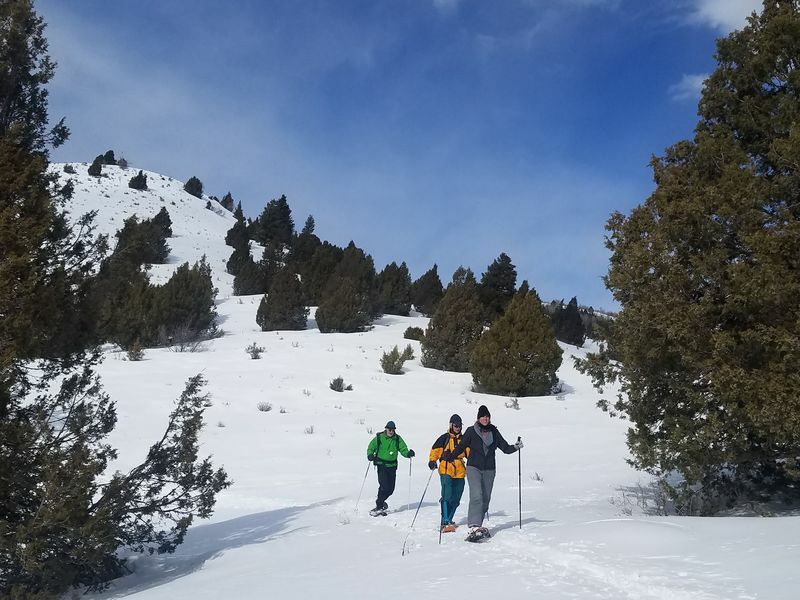 Thanks to Becky for photos and Dave W. for the narrative, photos and GPS data.